Garmin dezl 780 LMT-S has an average rating of 4.29 out of 5 based on 7 user reviews. Nobody understands the duties of a semi-truck driver unless they have worked in the profession. Most people simply think that a semi-truck driver simply takes cargo from point A to point B. While that is ostensibly the goal of their task, it is the paperwork, regulations, and ancillary tasks that people are generally not aware of. Thankfully, Garmin is a company that understands what virtually every driver needs–regardless of how niche their driving situation may be. To that end, they have made it a point to create an amazing GPS system that provides a litany of tools to make a semi-truck driver’s job just a little bit easier as well as a number of extra features for convenience. While it is unlikely to surprise people who are already well-established within the industry, Garmin actually has a long history of providing high-end products to the trucking industry. As such, when looking for a robust GPS navigator with numerous features which all appeal to a semi-truck driver specifically, Garmin comes through not only to provide an adequate option but perhaps one of the best commercial options on the market. This GPS navigator provides the standard fare of accurately detailing where you are and what your driving conditions are, but it goes so much further with a litany of features that are ideally suited for the task of transporting multiple tons of cargo hundreds of miles in a couple days. Whether you are interested in a route that is specifically designed for semi-trucks or need help managing your time while on the road, the Garmin dēzl 780 LMT-S GPS Truck Navigator has you covered. This is arguably one of the best features of the Garmin dēzl 780 LMT-S, but it is also likely one of the most common amongst GPS navigators designed for the market. That said, there is still no getting around the fact that the Garmin dēzl 780 LMT-S provides legitimate value for this task and will be able to help you avoid any roads or routes that would otherwise take you on paths which you would not be allowed to use. For instance, this GPS navigator will warn you if you are following a route that includes a road with weight restrictions or bridges that are not tall enough to provide height clearance. On top of that, the Garmin dēzl 780 LMT-S will also warn you of road-related aspects like sharp turns or elevation with steep grades. The best part is, all you have to do is enter the physical dimensions and weight specification of your truck into the Garmin, and the software takes care of all the rest. It is like having a guardian angel or a driving partner who actually knows what they are doing. As a semi-truck driver, there is always the balance between making your time and potentially arriving early and fulfilling the needs of your physical body as well as regulations which dictate a certain amount of time spent resting after driving for hours on end. In fact, it can be quite easy to accidentally forget about these things if you get on a roll and become too focused on the road and task at hand. Thankfully, the Garmin dēzl 780 LMT-S has considered this as well and offers a solution. With a function that automatically calculates and reminds you of when you either should or are required to take a break, you will not have to worry about pushing yourself, or the law, too far again. Even better, the Garmin dēzl 780 LMT-S is equipped with a database that identifies locations which are specific to semi-trucks or at least amenable to their presence for food, rest, fuel, ATMs, lodging, showers, and even WiFi. In the same way that you can allow the Garmin dēzl 780 LMT-S to take care of your route, you can also allow it to take the wheel, so to speak, in regards to your schedule more generally. Of course, as impressive as the functions of both planning the optimal route as well as keeping track of the human element behind the wheel are, the Garmin dēzl 780 LMT-S is still a singular device with a limited amount of memory and hardware. That is why Garmin sought to expand the Garmin dēzl 780 LMT-S/ capabilities by providing the option to connect the GPS navigator to your smartphone to have access to the Garmin databases, so you can have access to even more information. Garmin accomplishes this by allowing the Garmin dēzl 780 LMT-S to connect with their free mobile app, the Smartphone Link. This app will provide real-time reports on both the traffic and the weather. It can even provide up to the minute updates on parking availability within your area. One thing to keep in mind is that the Smartphone Link app’s service does offer a premium option which you pay for that includes even more information like images from local traffic cameras as well as live weather radar data to better make an informed decision. Arguably one of the more frustrating pieces of equipment that all semi-truck drivers are required by law to have as of 2012 is an ELD, or electronic logging device. This essentially provides a hard copy backup of all the relevant information relating to your truck’s current–and potentially past–journeys. Of course, Garmin makes it a point to offer a full-suite service and even provides an expanded connectivity option for their proprietary eLog ELD to work in unison with the Garmin dēzl 780 LMT-S. While the ELD will track all of the legally relevant information required, the Garmin dēzl 780 LMT-S will simultaneously present that information to you in an easy to read presentation. The only downside to this feature is that it requires you to be using the Garmin eLog ELD for it to function. Though, the Garmin eLog ELD is actually a fairly impressive ELD in its own right, so you should not necessarily consider that to be too much of a negative and will likely end up thanking Garmin in the long run for providing the impetus to switch over to their model if you have not already. While more and more states are adopting laws which require general drivers to use some form of hands-free format to use the phone while they are driving, semi-truck drivers have had to deal with this requirement for far longer. As such, any GPS navigator worth its weight in salt should come with a hands-free option. Considering the Garmin dēzl 780 LMT-S has generally surpassed all basic requirements so far, you should expect it to do so in this regard as well and it does not disappoint. First, to ensure that your hands-free functionality is not unduly interrupted, the Garmin dēzl 780 LMT-S provides a Bluetooth connection. When connected to your smartphone, the Garmin dēzl 780 LMT-S will serve as an intermediary with its integrated speaker and microphone allowing you to make or receive calls through the GPS navigator rather than having to use a separate device. In fact, you can even program the Garmin dēzl 780 LMT-S to provide custom alerts for texts and other apps which display on the navigator’s screen. Beyond that, the Garmin dēzl 780 LMT-S also comes with voice-activated commands, so you do not even need to touch the Garmin dēzl 780 LMT-S for most of the common functions you would need to access. Driving for hours on end can be hard, grueling work–despite the fact that those without experience would simply assume it is an easy job where “you just sit there.” That being the case, the body fatigues over time, and one of the first things to tire are your eyes. That is why the Garmin dēzl 780 LMT-S provides a large 7” screen which is comparable or better than most of their competitors. Even better, the Garmin dēzl 780 LMT-S offers a touchscreen, so if you do need to access a function not operated by voice commands, you will not have to take a hand off the wheel for long to do so. 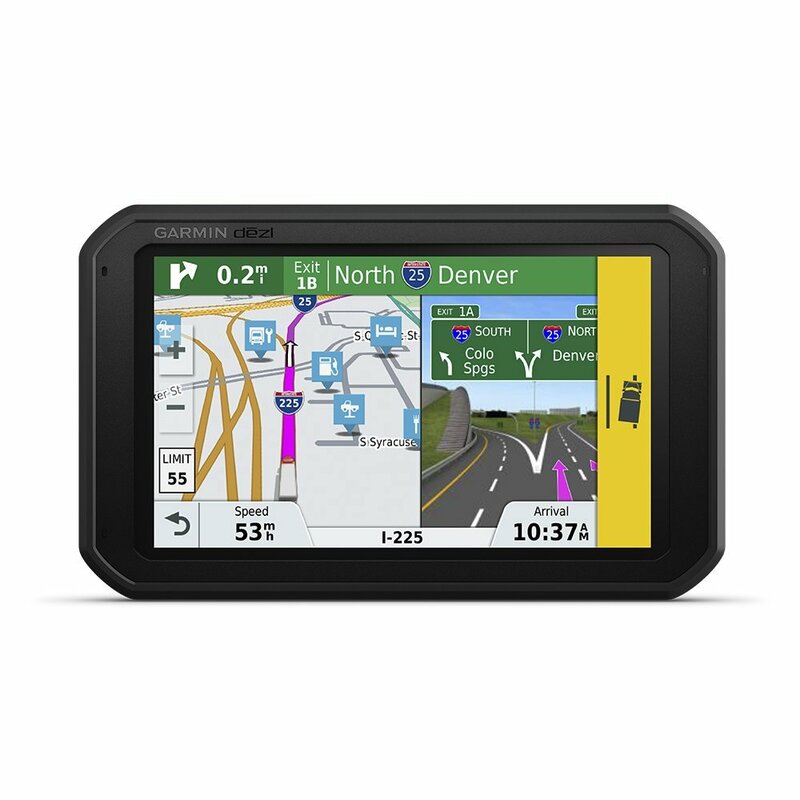 As we can see, the Garmin dēzl 780 LMT-S is quite an impressive GPS navigator specifically designed for semi-truck drivers. Whether this device is acting as your navigator and co-pilot, providing you free, real-time updates about the road and weather conditions, or simply tracking to legally required information about your journey and load, Garmin offers attenuated features to make your life on the road a breeze. You can get a great deal on Garmin dezl 780 LMT-S here. Actually, the 780 (unlike the 770) *does not* allow for voice-activated phone calls. The Phone command that was present on the 770 is missing from the 780, and there is no other way of accessing the smartphone interface by voice only. You have to use the controls on the screen. I contacted Garmin about this and they said it was by design. I just bought a 780 Garmin it looks like it’s running on an Android platform now. Hardware-wise it seems to be pretty good but software-wise it’s extremely lacking a trucking GPS that doesn’t show or alert you two upcoming weigh stations! most weigh stations in fact don’t even show up at all unless maybe if you’re on the East Coast or you add them as points of interest like I did and then spend a couple hours changing the icon one at a time and that still gives you no audible warning. I don’t know how this thing works in the rest of the United States but in Alaska it’s pretty horrible it tries to route me constantly through a double roundabout we’re even a straight truck has trouble going. If Garmin could fix their way station issue it would be a pretty good GPS, but I don’t think that’ll happen anytime soon because people have been complaining to them about this fact for a very long time. Other than that make sure you cross check the route the GPS gives you with a trucker Atlas, trust me if you don’t eventually you’ll wind up in a very bad situation. Well, I’m considering buying the 780. I have the 770 now, had it for quite awhile. I Like you don’t have to pay for traffic , something their competitor requires . And , to the 770’s credit , most of the time it’s spot on. I have a 379 , and the windshield is not real big , so I mount it up high , so I have a clear field of view. The drawback is that when the suction cup lets loose , it falls hard . I sometimes wonder if that’s scrambled it’s brain some. For example , I like the mile markers in the lower corner . Now , they appear and disappear nilly -willie. To , my other complaint is that the map database is not as good as Google Maps . Anytime I’m going to a new place , I check the 770 against Google . True , you can’t trust Google completely , as the routes are not truck specific , but doggone it , it rarely misses on an address . Example : yesterday, I went to a completely new place . Google got it right , the 770 ( with warnings ) was taking me into a Large subdivision nearby. Same address in both. The 770 was wrong , Google was correct . So, I’m on the fence about upgrading . $400.00 is not pocket change . If their map updates were as accurate as Google Maps , I would Gladly shell out the bucks . One more thing . I’m on a family cellular data plan . Any device that uses up my data allowance ( over 16 Gigs ) is out of the question . I use about half of that myself , so I’m not willing to allow a device to connect to it , without knowing how much data it will burn thru. I did have some trouble with the software right off the bat, as I posted earlier. It looks like the GPS unit itself is fine. However, it doesn’t come with the SD card so you need to buy one before you even start installing 7 GB worth of software and map updates. I managed to get the software installed, but the mapping update still fails even over fast Wi-Fi or straight from PC. On the positive side, the unit is super well-constructed, you can drop it on the floor without it missing a beat, and both the magnetic and suction mounts work very well. Also I like that the Android app feels very familiar and simple to use. We’ve used the device to log over 1,000 miles of IFTA and IRP driving. The GPS logged all the major routes and the unit odometer was only off by 1. The trip logs can also be saved to Excel spreadsheets whenever you like. We download and review them weekly, so this in itself is worth the purchase price. It’s also good at routing around low bridges and roadway problems. The camera shows quality HD images, and allow you to start recording at any time and save it so it doesn’t get over-written. This is handy if you find somebody else is driving wildly and you feel you should document it. It also saves fuel info, and it would be nice if this went into the same spreadsheet but I haven’t figured out how to do this. You can export the total fuel pumped and price paid, but not by mileage or location. This GPS has several new features that are not there on 770. There is no need for xm receiver if you want to use weather and traffic. It can get it with bluetooth or wifi. All updates are done using wifi so you don’t have take it out of the truck and plug it into a computer. It’s built on top of an Android tablet platform just like new Rand McNallys but the tablet is much more rugged than RM and it will most likely last longer. The speaker on this unit is much louder than 770. Also, the bluetooth connection seems much less prone to interference which was a big problem with 770. I can use this GPS as a hands-free phone device which I couldn’t do with 770. Great GPS in conjunction with Google maps works great for me.